Greetings friends and fellow crafters. LeeAnn here with my first post of 2018 and my first post as a first quarter guest designer with White Rose Crafts. White Rose Crafts is an online store in Virginia, USA that carries a great variety of product, including some favorites from UK. So, for my first project I decided to dig into my stash of stamps and find some I have had for a while but never used. It's a great thing to have product the company sells when you join their team as you can get started while waiting for your design team package. ANYWAY... for todays project I used Lawn Fawn's Love You Tons stamp set. Using Recollections 110 lb red card stock as the base topped with a layer of 110lb white, and a 65 lb sheet from a 6x6 Recollections paper pack called "Be Mine Valentine". I stamped the Elephants with Memento Tuxedo Black and used the dies to cut them with my Big Shot. I then colored using my Memento marker in London Fog. I doubled up on the lines to add shading. 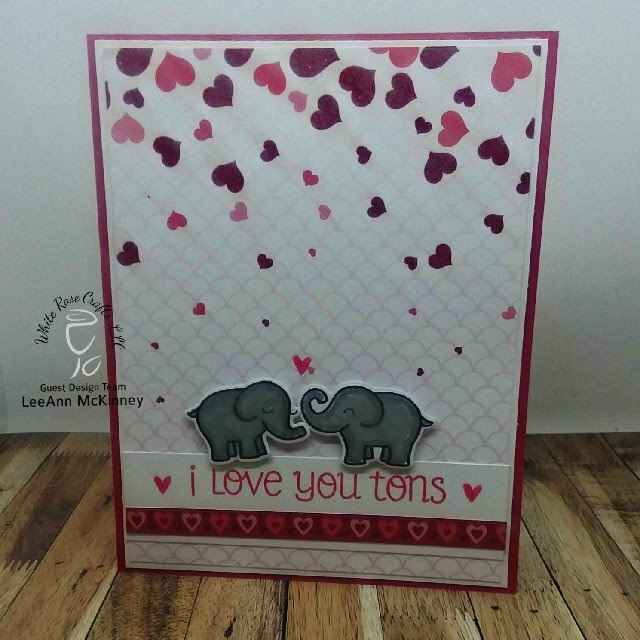 I cut a 1" x 4" piece of 110 lb white card stock, stamped the sentiment in Ladybug Red a well as the hearts at the beginning and end of sentiment and above the elephants trunks. The row of hearts under the sentiment is a strip from the paper pack. I hope you liked today's project. I will be back again soon, with another project from White Rose Crafts.